DINOSAUR | In the farthest northwest corner of Colorado a storm is brewing. On Jan. 29, approximately 10 percent of the residents of the Town of Dinosaur met at the Highway Bar and Grill just off Highway 40. This was not the typical crowd at this establishment. Business owners and community members were outraged and upset by events that had recently taken place. Accusations of serious government corruption including financial mismanagement, wrongful termination, obstructing justice and discrimination at the hands of the town council and town mayor were the main topics of discussion. According to meeting organizer Leona Hemmerich, an incident involving her business set off the recent chain of events. Hemmerich, owner of Gateway Conoco service station and truck stop, alleged that her business was targeted by the town council and Mayor L.D. “Smitty” Smith. After allowing a truck driver to park his rig at her business and stay in it overnight, she received a letter from the Town of Dinosaur stating that she could not allow semi trucks to park on her business property overnight and that her business is not a truck stop, although she says it’s been a truck stop for more than 30 years. “The letter did not include any ordinance or law that would substantiate their claims,” she said. There is, however, a town ordinance forbidding living in campers. Hemmerich was unaware of this ordinance, and said others in town are living in campers on private property. On Jan. 28, Marshal Reed was terminated from the position he’s held since August. The previous marshal left in July 2018 and before that there was a two year period with no local law enforcement according to the townspeople. These events prompted the organization of a town meeting attended by Moffat County Sheriff K.C. Hume and Rio Blanco County Sheriff Anthony Mazzola. Sheriff Hume immediately announced that two of his deputies were at the Dinosaur Town Hall as he spoke, assisting the 14th Judicial District Attorney’s Office with a criminal investigation against the Town of Dinosaur, regarding the town and the town leadership. The search warrant and all information regarding the investigation is currently sealed. 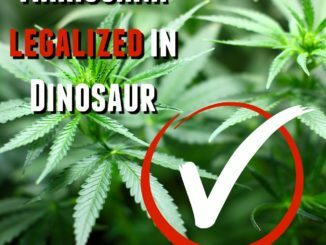 The subject of the investigation is not yet known, but several Dinosaur residents have contacted the 14th Judicial District Attorney’s Office alleging financial mismanagement of increased tax monies related to Dinosaur’s legalized recreational marijuana initiative and other complaints including the lack of law enforcement in their area. According to Sheriff Hume, “The Town of Dinosaur is an incorporated town and has statutory authority and as such are required to provide their own law enforcement.” The town can contract services from Moffat County Sheriff’s Department.” As of press time Wednesday Dinosaur was still without contracted law enforcement. Sheriff Hume said at this point he has no authority to bring law enforcement into the town. In the event of a property crime such as burglary, larceny, theft, motor vehicle theft, arson, shoplifting or vandalism, the townspeople will have to contact Mayor L.D. Smith. Moffat County Sheriff’s Office will only be responding to “crimes against persons in progress.” The expected law enforcement response time would be between 20-90 minutes depending on which deputy responded. “It is hard to recruit and retain law enforcement in this area,” Hume said. Meeting attendees asked why they haven’t seen the deputy assigned to their area recently. Both Sheriff Mazzola and Sheriff Hume said the current Moffat County deputy for the area is Deputy Dallas Coker and he is assisting the Town of Rangely while two of its three law enforcement officers are on leave due to the shooting investigation from Dec. 10. Concerned business owners from the three new recreational marijuana dispensaries: Rocky Mountain Cannabis, DinoTreats Dispensary and Dino Dispensary LLC, voiced their concerns about not having readily available law enforcement to investigate property crimes. They are now considering private security in the wake of a recent break-in at Rocky Mountain Cannabis, where perpetrators stole several ounces of marijuana and caused extensive damage to the doors on Jan. 6. The meeting lasted approximately an hour and residents collectively agreed to work on a recall petition for the entire town council, including the mayor. “If we can collect signatures from 40 percent of registered voters they can do an emergency election to recall the elected officials on the town council and reappoint or elect new members,” Reed said. A petition reading: “To the Mayor and Members of the Town Council of the Town of Dinosaur in the State of Colorado, We the undersigned are in support of a financial audit from an outside source be conducted on the Town of Dinosaur. We the undersigned are concerned citizens who urge our leaders to act now to have a financial audit conducted on the Town of Dinosaur,” was passed around to residents able to vote within the Town of Dinosaur. Also during the meeting a petition to reinstate Darren Reed was passed around and eagerly signed by attendees. Reed expressed his interest in returning to his position but was unable to comment on any other matter. Residents agreed that Reed was a great town marshal and said his presence in the community was well received and very appreciated. Dinosaur council members and town staff were called to appear in court this week in Moffat County. Mayor L.D. Smith and the town clerk said they could not provide any comments on the investigation or last week’s meeting. Going forward, Dinosaur residents can expect to see neighbors and friends going door to door to collect the signatures required for the recall petition, the audit and the reinstatement of Darren Reed as town marshal. A GoFundMe page for financial assistance for Reed was set up by a town resident and has collected $250 of the requested $6,000 by three people in four days. The town has listed the marshal’s position on its website including a job description, personal history questionnaire, and a job application. Meanwhile, residents and business owners of the small town of Dinosaur await the reinstatement of Reed or the hire of a new town marshal and the outcome of the district attorney’s investigation. A Facebook page has been created for Dinosaur residents to provide a “forum for people to express their concerns and to unite to better our community.” View at http://bit.ly/2GqU7Zt. The next Dinosaur town board meeting is scheduled for Feb. 12 at 6 p.m.
DINOSAUR I On Monday afternoon, Highway 40 was closed in both directions approximately 8 miles east of Dinosaur in response to an officers-involved shooting incident that left a man dead.